Due to ATEX directives, containment during the processing and transfer of pharmaceutical powders is a high priority, and various measures must be in place to account for explosion risk. In addition, the contained screening of pharmaceutical materials and contained transfer between vessels is imperative for operator safety, as well as protecting the product from contamination. Sealed powder transfer bags and vessels are used to transfer pharmaceutical products from one stage of production to the next. When it comes to loading or unloading the powder to and from these vessels, hazardous dust and fumes can be released. A leading manufacturer, seeking the contained transfer of pharmaceutical powders after screening, contacted Russell Finex for a solution. As well as providing containment, this solution also needed to be capable of sieving fumed silica (a very fine form of silicon dioxide), notoriously difficult to sieve due to its extremely low density. The key focus for Russell Finex was how to integrate a split butterfly valve into a sanitary industrial sifter. Split butterfly valves, also known as active/passive valves or powder transfer containment valves, provide containment when transferring product from one machine or vessel to another. They minimize the levels of dust emitted to exterior surfaces and the surrounding environment before, during and after transfer, and are commonly used in the pharmaceutical industry to meet ATEX directives. To guarantee product containment during powder transfer, Russell Finex integrated a split butterfly valve with a Russell Compact Airlock Sieve™. 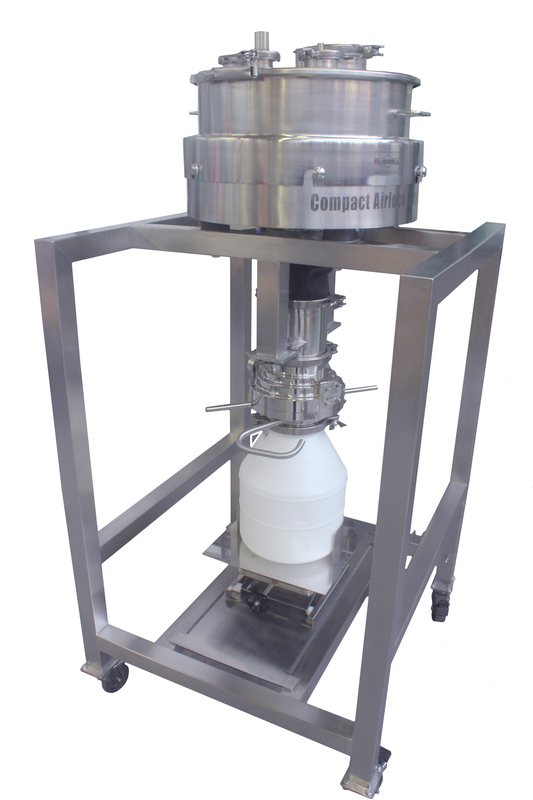 The Russell Compact Airlock Sieve™ benefits from a patented TLI (twist, lock and inflate) airlock clamping system, providing effortless operation and maintenance whilst maximizing screening performance. 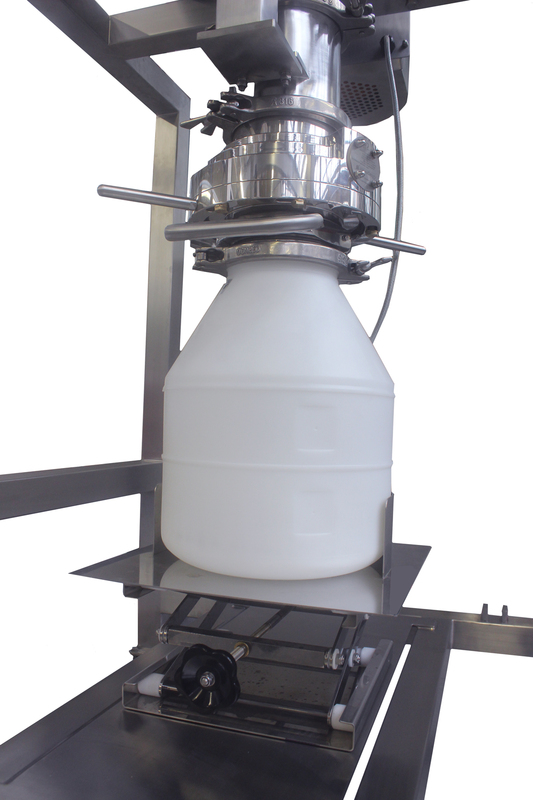 This pharmaceutical-standard aseptic sieve accurately removes oversize contamination within a contained unit, ideal for check-screening pharmaceutical powders. An inflatable seal locks the components in place during operation, reducing the release of hazardous dust fumes with OEL 5 containment (less than 1µg/m3). Due to the vibratory operation of mechanical sieving equipment, it is important the surrounding housing and components are designed to withstand continuous vibratory force. Typically, powder transfer containment valves are not engineered to withstand this type of force, and are extremely heavy, meaning further strain on surrounding parts. Russell Finex engineered a specifically-designed support structure as well as a flexible connector, to absorb and isolate this vibration. This ensures the valve remains fully operational, ensuring downtime is kept to a minimum whilst safeguarding operators. With conventional sieving systems, when screening difficult powders such as fumed silica, blockages can occur in the sieve mesh. The Russell Compact Airlock Sieve™ complimented with the Vibrasonic® Deblinding System, eliminates this problem. This ultrasonic screening technology effectively breaks the surface tension of the mesh, allowing the good particles to flow through freely. Keeping operators in mind, this customized pharmaceutical screener also incorporated a scissor lift device, to help operators load and unload the powder transfer vessel before and after filling. These vessels are often quite cumbersome, and can be extremely heavy when carrying product. The scissor lift allows operators to easily load the container onto the unit, and elevate the container to the valve, without manual lifting. To further enhance usability, a ‘truck and trailer’ connection was also incorporated into both the sieving unit and control unit stands, allowing transportation of both units as one. This is particularly useful for sanitary applications such as this, where units must be transported regularly to a separate area for cleaning. Established in 1934, Russell Finex has a wealth of experience in supplying leading manufacturers with hygienic pharmaceutical screening technology. With a customer base including Pfizer, GSK, Wyeth and Sanofi-Aventis, Russell Finex provides high-quality solutions for contained pharmaceutical processing and powder transfer. To discover how technology such as this could optimize your production process, contact Russell Finex today.